We regularly receive questions from clients about motorcycle accident injuries. Visit our Frequently Asked Questions section to find the answers you’re looking for about your right to seek compensation, dealing with insurance companies, and more. Can I still file a lawsuit after a motorcycle accident if I wasn’t wearing a helmet? It’s something that no rider likes to think about for long, but the fact remains that riding a motorcycle carries an inherent level of danger, and accidents can cause devastating injuries. Even the most careful rider on the road can’t always account for the behavior of other drivers. Sooner or later, another vehicle may cause a crash with a motorcyclist, and the rider may not be wearing a helmet in South Carolina. In situations like this, one of the biggest questions that attorneys get asked is from victims who wonder if they can still sue the other driver for the accident. The answer to whether you can file a lawsuit is a qualified “yes.” You can absolutely file a lawsuit against another driver whose negligence or recklessness caused your motorcycle accident, even if you weren’t wearing a helmet. The success of your suit will depend on a few important factors. First, it’s important to realize that South Carolina law says riders over the age of 21 are not legally required to wear a helmet. In other states, where wearing a helmet is required, your lawsuit could face a much greater challenge, since not wearing a helmet directly violates the law. This situation can occasionally catch riders who cross state lines without realizing the change in law over the border. One example is when riders visiting Myrtle Beach during Bike Week may decide to venture further afield and cross the nearby North Carolina border, where helmets are required. If an accident happens across the border and the rider is not wearing a helmet, an injury lawsuit could be more difficult, particularly if it involves a head injury. Even in states like South Carolina, there may be some challenge to a lawsuit if you suffered a head injury, as the other driver may claim that not wearing a helmet contributed to your head injury. However, there is a powerful legal tool that can still help victims recover in situations like these. When the other driver offers a challenge to your lawsuit, South Carolina follows a type of law called “comparative negligence” to determine who is responsible for the injuries and other damages in an accident. What this means is that under South Carolina law, even if you are found partially responsible for your injuries, you are still eligible to receive compensation, so long as you can demonstrate that the other driver (or drivers) were more than 50 percent responsible for the accident. When determining your final compensation under comparative negligence rules, the award will be reduced based on how much liability you are found to have for your injuries. For example, if the court finds that the other driver is 80 percent responsible for the accident and that you are responsible for the remaining 20 percent, your award will be reduced by 20 percent. In this situation, if you were awarded $50,000 by the jury, it would be reduced to $40,000. However, if you were found to be over 50 percent liable, you would not be eligible to receive any award at all. Most states these days have accepted some form of comparative negligence as law, but a few (including our neighbors, North Carolina) still follow a rule called “pure contributory negligence.” In these states, if you are found to share in any part of the responsibility, you are not allowed to receive any damages at all. While you are under no obligation to wear a motorcycle helmet in South Carolina if you’re over the age of 21, the fact is that helmets save lives. Statistics from the Centers for Disease Control and Prevention show that wearing a helmet reduces the risk of death by as much as 37 percent, and reduces the risk of head injury by 69 percent. If you’ve been in a motorcycle accident, don’t hesitate to reach out to a personal injury attorney as soon as possible. An attorney can help you protect your legal rights in an accident and determine if you are able to seek compensation from the ones responsible for your accident. The Law Office of Kenneth E. Berger is proud to stand up for the rights of motorcyclists across all of South Carolina, including the Myrtle Beach, Columbia, and Florence areas. 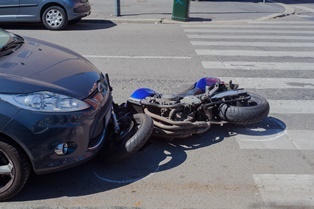 To speak to an experienced legal professional and arrange a consultation about your motorcycle crash case, call or email us today. Posted on 09/21/2013Texting & Driving in SC: Should Anyone be Held Liable Other Than the Driver? ?Can I still file a lawsuit after a motorcycle accident if I wasn’t wearing a helmet? Posted on 08/13/2013 Can I Still Recover Damages If I Was Not Wearing a Helmet and Suffered a Traumatic Brain Injury in an Accident?